It is no secret to anyone who reads this site that I’m a Patriots fan. This immutable fact probably forces you to not like me very much. But despite my unfortunate upbringing, I’m capable of giving credit where credit is due. CONGRATS TO THE BUFFALO BILLS AND THEIR FANS!! You guys beat the Patriots at their own game, and exposed what I had feared was a fatal flaw of the team in the off season. It’s easy to forget that we don’t have a pass rush when Tom Brady is throwing the ball all over the shop. 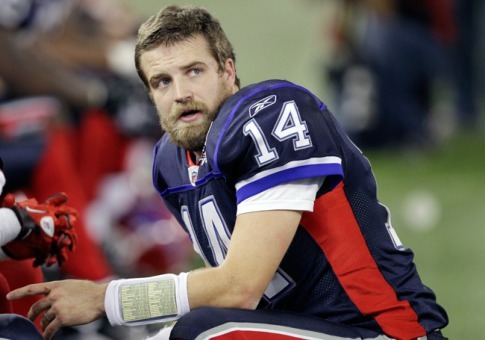 But the Bills were able to move the ball at will because the Patriots couldn’t get to Fitzpatrick. The Bills are 3-0, in sole possession of first place, and deserve credit for both. Good luck this week in Cincy. Should be a cakewalk. What? What do you mean jinxed? Bills fans aren’t fatalistic, pessimistic, or superstitious, so they don’t buy into that, right? After three weeks I find myself 1-2, due in large part to Gronkowski and Welker blowing up last week. I lost in fantasy because two players on my favorite team had career days in a losing effort. Ugh. QB – Rivers. Had really high hopes for Rivers this year. He has underachieved so badly that I considered shopping him, but patience won out. I still think he has a monster season left in him, and who better to bring it out than the Dolphins. RB – McFadden. Third week in a row (Rivers vs Pats, Me vs Welker/Gronkowski) that my fantasy interests have butted heads with my real life interests. Patriots fan or not, I’d have to be all hopped up on goofballs not to start McFadden this week. WR – Malcolm Floyd. I dropped Roy Williams in favor of Floyd, who won’t officially join my team until Saturday. If the waiver request doesn’t go through, like the one I tried last week with Jahvid Best, then I will be starting AJ Green here. WR – Mike Williams. has to be due for a breakout game, doesn’t he? Flex – Tim Hightower. Been steady Eddie so far (averaging just over 13 points per game) and I think he goes off against a Rams team that will have a hard time moving the ball. TE – Scott Chandler. Chandler agains the Pats is a better option than a banged up Pettigrew against the Cowboys. D – Baltimore. Sanchez should be good for a fumble, and an interception or two. Matt Ryan. On the road against Seattle doesn’t seem like the right recipe to get the Falcons offense on track. I expect a heavy dose of Michael Turner this week which means you should sit Ryan. Devery Henderson. Had a couple big weeks with Lance Moore and Marques Colston on the shelf. Production slipped drastically with Moore back in last week. Would only start in three WR leagues or if dealing with injuries. Rashard Mendenhall. Houston should put up lots of points, even against the Steelers. That means Pittsburgh could have to abandon the running game early. 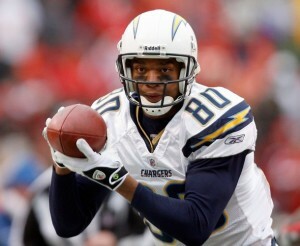 Malcolm Floyd. Big, big week for the Chargers offense means you should try and get Floyd into your lineup. I did. Delone Carter. Colts are 0-3. The path to 1-3 doesn’t begin with Curtis Painter throwing the ball 35 times. Could be a big day for the rookie RB. DeaMarco Murray. With Austin out, and Dez Bryant questionable, the Cowboys know they will need to run the ball in order to keep Tony Romo protected against Suh and the rest of the Lions D. That bodes well for any Dallas RB. Good luck in Week 4 everyone. Enjoy the weekend.